In this photo Disney background artists Al Dempster, Bill Layne and Art Riley are examining character color model cels and background paintings for The Jungle Book. You can see that early edgier work by Walt Peregoy has given way to a more realistic, romantic interpretation of the Indian Jungle. 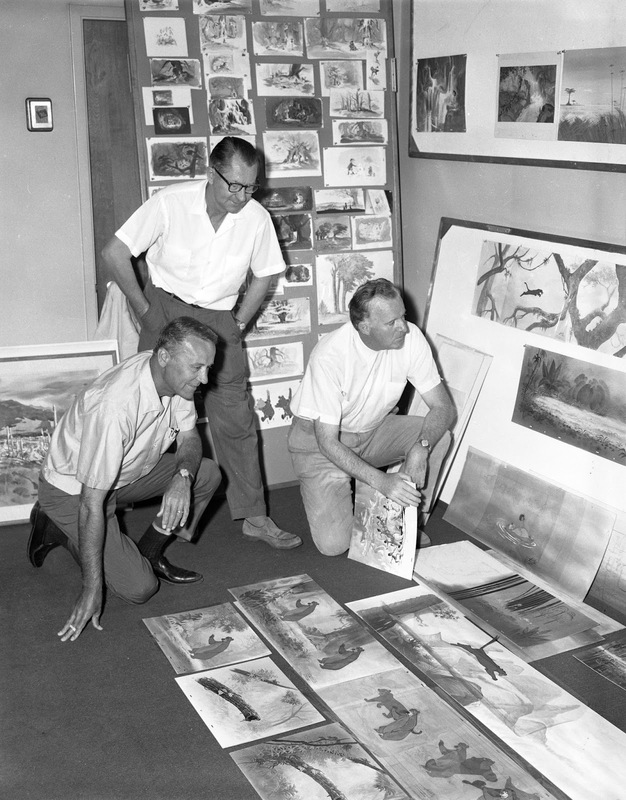 I believe at this stage of production Baloo was painted as a brown bear, before Walt Disney asked for a different color (there had been plenty of brown bears in Disney films before.) 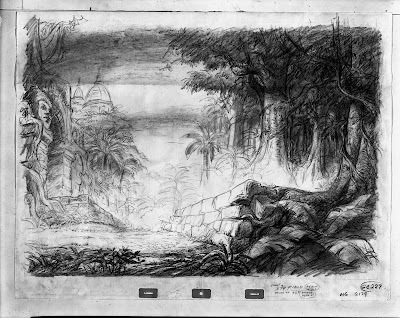 Since Walt was no fan of the Xerox line, particularly in the backgrounds, he requested a less graphic and a more painterly approach toward the film's art direction. A B&W still from the title sequence. Fantastic use of light. 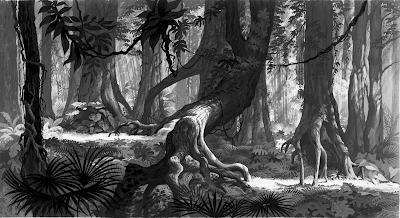 Mowgli walks through this setting after parting ways with Bagheera, the panther. It's interesting to see that the painters found it necessary to add black contours to background elements that would be in contact with a character. 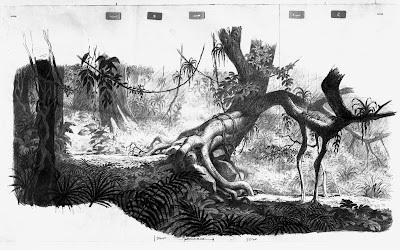 Bagheera walks over this branch, and since his outlines are black Xerox, character and background become a little more unified. I've always liked the color mood in this scene by Ollie Johnston. 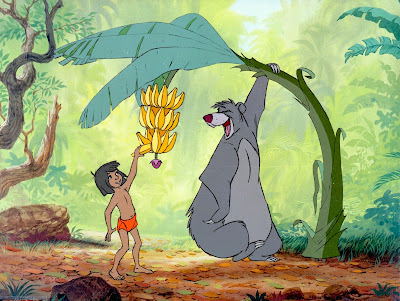 Look at how Mowgli's red shorts pop in front of the lush green tones. A German journalist once told me that part of the reason why Jungle Book was his favorite animated film was the fact that you spend over an hour in a richly painted exotic jungle. Very easy on the eyes.